Twitter introduced a “Buy” button on Monday, September 8 that allows users to shop from the comfort of their Twitter feed. For its test run, Twitter selected 28 organizations comprised of musicians like Eminem and Pharrell; charities such as GLAAD and RED; and retailers Burberry and Home Depot. Organizations are limited to selling physical goods (read: no gift cards) and may post items for sale in their news feeds or as part of paid promotional tweets. Don’t bother looking for the Buy button from a computer, though. It is visible only on the most updated Twitter apps for iPhone and Android. Twitter plans to extend Buy button usage to more companies, but as of this posting, a timeline for expansion has not been announced. What does this mean for SMB retailers looking to get in on the action? Watch and learn—look at how the beta-testers are leveraging the new feature and take notes. Thus far, things have been, well, kind of boring to be honest. AIDS research charity Red is selling t-shirts. Pop-punk band Paramore is selling t-shirts. Poverty awareness charity Global citizen is selling t-shirts. Most organizations and artists involved have not done anything at all with the Buy button. Eminem tweeted that his new record is for sale on iTunes the day the button launched. Ryan Adams put his album up for sale with an Amazon link. Nothing from 9/11 Day despite a busy week for the charity. Things have been slow thus far. What Does the Twitter Buy Button Mean in an e-Commerce Context? Remember it is the Buy button’s potential that is the crux of the story. Its launch alone presents several takeaways for SMB marketers. This is the beginning of Twitter’s foray into e-commerce. Twitter is a public company that generates most of its revenue through advertising, so this is a logical next step for the microblogging service. It wasn’t a surprise for folks paying attention; Re/code posted a mock-up of the button in January. In-app shopping actually isn’t new for Twitter. In May, Twitter partnered with Amazon to launch a feature that enabled shopping from your feed. Say a user came across a tweet containing a link to an Amazon product. By replying to that tweet with a hashtag #AmazonCart, that item gets placed the user’s cart for later checkout. Similarly, Starbucks’ @tweetacoffee program synced users’ Starbucks accounts to their handle, which enables gifting between users who can redeem $5 eGifts at store locations. There is a social media arms race towards e-commerce functionality. Facebook, Twitter’s biggest rival actually started sooner, with a very small Buy button rollout back in July. And whereas Twitter’s trial run involves larger organizations, Facebook started with SMBs. Pinterest, the most naturally catalog-like platform of the bunch, is testing a buy button as well. Security is a concern for users. The convenience of in-app shopping requires that users’ credit card numbers are stored on the platform—Twitter has partnered with Stripe to process mobile payments—and promises that card info will not be shared with retailers. Retailers will have access to associated user names and addresses, which they may use for marketing purposes. The Buy button is designed to “sell anything that is perishable, with a temporal component to it.” Words of advice directly from Twitter head of e-commerce Nathan Hubbard. What Does It Mean Specifically for SMB Retail? This whole story of Twitter, Facebook, and eventually Pinterest stepping into the mobile e-commerce game points to more people spending more time (and more money) on their smartphones. The statistics are there—the mobile e-commerce market is projected to hit $370 billion in 2017, accounting for more than a quarter of e-commerce as a whole. The newest mobile devices suggest the same, with their oversized screens and tablet-like functionality. The new Buy button probably will not significantly change basic Twitter marketing tactics outlined in the guide. The rules for engagement remain essentially the same. 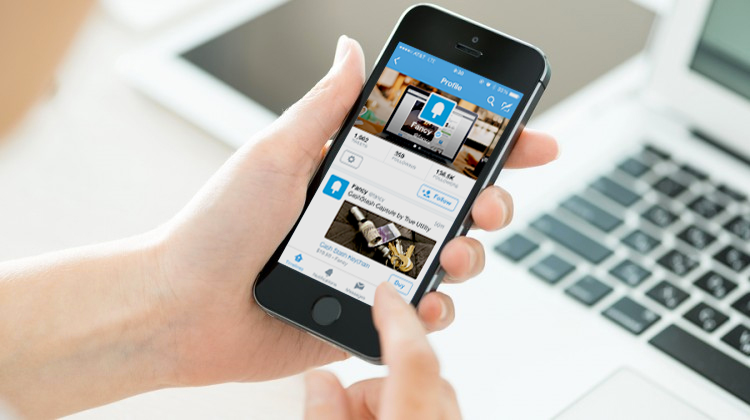 The Twitter Buy button is just one more potential tool for businesses to use.